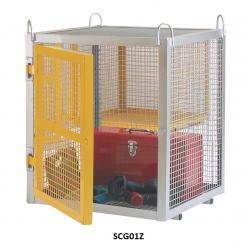 Our High Security Cages are the choice of the highstreet retailers and have been widely used to protect their most valuable items of stock. The High Security Cages have been used to protect items including mobile phones , computer consoles and games by several high street retailers . The range has also been specified by councils to protect confiscated items of contraband. 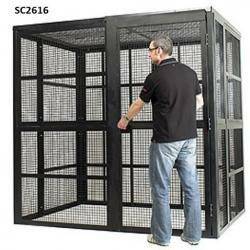 The cages are based on a standard 2.6m width and 2.0m height with a varying depth. All the cages are of a modular design with fully welded 5mm thick panels which are delivered palletised for assembly on site . Once assembled the cage will resist the most determined of attacks. The panels are filled with 3mm Steel square mesh to give the user the convenience of high visibility without compromising security. The steel 1m wide door has a Mortice Deadlock with a steel panel shielding the mechanism to prevent tampering with the lock. The door is positioned on the 2.6m face. Our cages are attractively finished in Black paint. 50mm Square 5mm thick angle iron.